For an enlarged view, click on the score box. TenTec 1340 to an inverted vee at 40 feet. The antenna was covered with 3/8 inch of ice and the SWR was much higher than usual. I had to use my tuner to feel comfortable transmitting with such a high SWR. It took me nearly an hour to make my first QSO using search and pounce and I think there was more activity than the past few Sprints. Oh well...I don't think I'll have to worry about ice next month but you never know. AB0CD almost heard me but then QSB took him out of the picture...thanks for the try...maybe next month we'll complete the QSO. Thanks to all of the participants and thanks to the organizers. Hopefully, we'll connect next month. I used the QRP ARCI Club call to celebrate their 50th anniversary. Since I announced my fq on QRPSPOTS, the score should not be counted in the standings. In any case, it was a fun time. 20 m was open for a few minutes. 40 m was, as usual, the workhorse band. 80 m didn't yield much success. The number of folks on the air brought back memories of when the Spartan Sprint yielded nearly 100 Qs. Thanks to all who stopped by. The background noise on 40m decent, and I have the impression that propagation was generally good this evening, so I would have liked to have done better, but I guess I'm still learning the ropes. I'm definitely doing better when calling, so I think I need to work on my pouncing skills. Until next month - cheers. Good to hear some new calls. Was surprised to make a contact on 20m. Managed 16 QSO's mostly 40m. Running the FT817 at 5w into a ground mounted vertical. Thanks to all. K3/10 @ 5 Watts to a 40M extended double-Zepp and a 20M wire delta loop. Started out skinny but the m/c battery dropped to 10.4V on transmit, so I went back to mains power. After removing dupes, I had 1 Q on 20M (K6JSS/7), 11 on 40M and 10 on 80M. It was very pleasant to enter four new (to me) calls in the log. Most difficult station to hear: W5ACM. Easiest: W5ESE. All three of us are in TX. Had fun. Sure enjoyed the Sprint and was able to use my KX1 to a S9v antenna which work really good. Just need the operator to practice a little more and become efficient. The kind of fun an old man should have. Excellent conditions for a time on 20M got 3 SPC's; On 40M got 4 SPC's inall worked GA, ID, WA, CA, AZ, MN, TX from here in CA. Ant. 40M half Square @ 5W in Icom. Forty meters sounded great but only had 45 min to operate. Got real windy here in Southern California and I had to crank down my antenna and disconnect cables. I could only hear signals on 80M, and it was NOISY! Then, one of my LiPo batteries puffed up and DIED with a QSO almost in progress and about 25 minutes left in the event. Others in the Houston area heard and worked stations on 40M, but I didn’t. 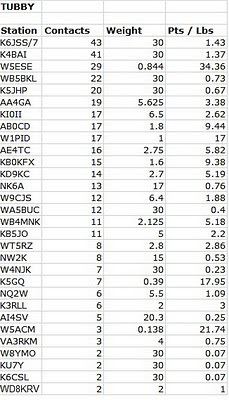 The RTTY stations took over. Thanks to WB5BKL, K4BAI and W4VHH for my 3 contacts. The rig was my usual ATS-3A with two 200 mAh LiPo batteries and the ancient 18AVQ vertical. I have removed the dead battery, and have another similar (used) 190 mAh cell epoxied into the balsa case – ready for next month. I have been hearing and working DX on 10M during the day, and was hoping for some 20M contacts, but not yet. Maybe next time! 20 was good but short lived. 40 was decent and busy. 80 was tuff going. Enjoyed the SP. My first Spartan Sprint. All QSOs on 40m, I made a pass through 20m about half-way through the contest and heard RK0AB with no takers, so I called him and he came right back...unfortunately I couldn't get his power, so I couldn't count the QSO for the SS! Running FT817ND on internal batteries at 5 watts to a Par 10/20/40 up about 50' or so. The Bencher paddle really added to the weight...I'll have to do something about that to work on my skinny score! CU next time! Good conditions and participation this month. I used a KD1JV AT Sprint 3A with a 9.6V wall wart and Whiterook MK-44 paddles. My antenna was a 300' horizontal loop, fed with open wire line. Good to hear some new folks playing in this event that I hadn't contacted before (welcome! ), as well as old friends. 20M was open to the west at the start (4 QSOs). 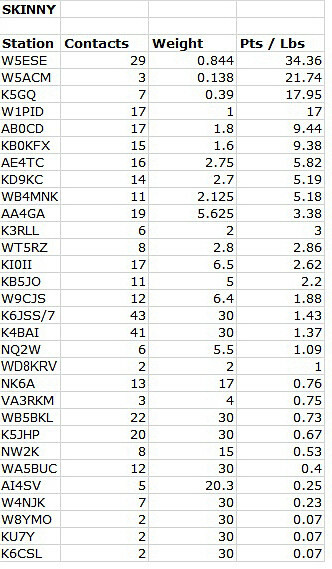 40M was quite good for stations as far away as AZ and WA and NH and as close in as VA and FL. Know NC and GA stations were QRV, but they were within my skip zone. Great bonus to work the QRPARCI 50th Anniversary celebration station for this week in ID, K6JSS/7, operated by Randy, K7TQ. 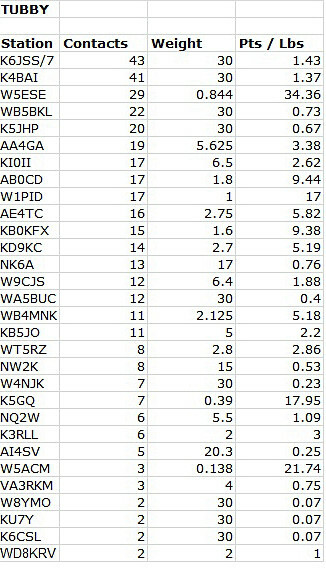 24 QSOs on 40. 80M was fair with QSOs out to NM. A few in TX and CO couldn't hear me calling. Did hear VE3CGC on 40M calling W5ESE, but no QSO this month. With increasing sunspots, we need to be sure to check 20M in the sprints rather than going straight to 40M. See you all next month. 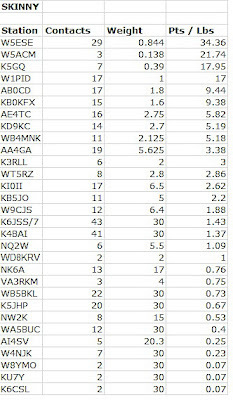 Plagued by digital QRM all over what used to be "our" QRP frequencies, I almost gave up but came back later and found a few Spartan Sprinters on 40 meters -- including K6JSS/7. (Thank you!) Nothing heard here in FL on 80 or 20. Am submitting my log to save someone else from being last on the list. I'm not even sure if the second contact copied my info ok or not as he went into the noise as he came back to me! At least I worked K6JSS/7 for the test! Got a 30 minute late start due to some personal obligations, but had a blast...heard a lot of folks, but couldn't seem to get my signal to all of them. First time I put the Hendricks QRP Kits PFR3 (Steve Weber KD1JV design) on the air for the Spartan Sprint. Just had 20/40 available for the contest. Good band condx until 40 went quiet. Great test for the rig. Operated from home with an 88-foot doublet up 23 feet and a Palm paddle using the PFR3's internal keyer. Ran the PFR3 on 8 internal AAs that have been in the rig for several months. Looking forward to the summer Bumble Bee. The wind was howling in El Paso, so out-door operating was out of the question tonight. Started out on 20m. Got 3 contacts in 18 minutes, and another 5 minutes of CQing got nothing more, so off to 40m. Got 5 contacts in 40 minutes on 40m, then tried 80m at the top of the hour. Averaged about 1 contact every 10 minutes on 80m. There were a few stations calling who just couldn't hear a reply. I heard WA5BUC and KI0II get several replies, but they just kept on CQing.... frustrating. Heard several new calls in the sprint - WELCOME to you all - please do come back. All in all, another fun sprint. Looking forward to next month. Good Sprint tonight. Started on 20. Gave a couple of CQ's before moving to 40. Made 9 Q's on 40. Then went to 80 for 2 Q's before finishing on 40 with another Q. Rig tonight was my FT-817ND at 5w to a 100' end-fed inverted vee up 40' or so in Houston. Just a short hunt to find ZL1CDX on 28019KHz. I found no one on 15M or 20M, then I finally found AE6N in AZ on 40M. This was my second sprint and had much better results this time. I think I ran out of 40M contacts working only this single band. The band was very quiet with easy to copy signals. I notice this sprint seems to have a wide variety of speeds compared to others I have participated it. Elecraft K1, 5W, 80M Loop up 25ft. Ten Tec 1340 and Center Fed Zepp. 5W. K3 to 20 meter EDZ . 40 was good for first 45 minutes, then seemed to go away, at least everyone seemed to leave. North and South prop seemed to be the best. Worked from GA to NH to MI but CO was only state west of the Mississippi heard from the TX coast. Looking forward to next month. First time. Need to put the station on a diet. ATS-3 5W dipole at 25' WOW those RTTY stations were strong. Did not hear anyone on 20M. Went to 40 and found a clear spot. ATS-3 has a narrow 400Hz filter Thanks to W8RTJ; KE0G; K4BAI; K5JHP; WA4AN; W4VHH; WT5RZ for working me. Also glad to work a new station WT5RZ.